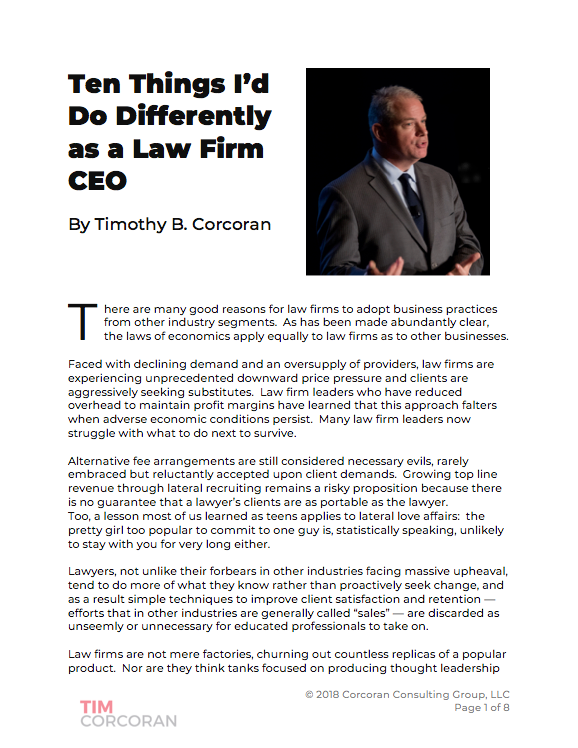 Law Factories vs. “Bet the Farm” Firms Will law firms of the future need to segment clients in new ways? Might some firms focus on “industrialized” practices: hyper-efficient work using automation and low cost resources? Might others focus on “bet the farm” cases using mainly top legal talent? Or do we need to focus on the “bread and butter legal work” middle ground? If the market segments, will it do so by practice, by firm, by matter type or along some other dimension? Can a single firm play both ends of the spectrum (factory and farm)? How big is the middle “bread and butter” segment and can this be industrialized? If paradigm is true, what are the implications for marketing. For professional development? For ethical compliance? Should law school teach lean six sigma, process mapping, or industrial engineering? Alternative service providers - cause or effect? If you don't recognize the speaker names above, then you aren't paying very close attention to the colossal systemic and sustainable changes being wrought in the global legal services marketplace today. Google any one of the names and you're bound to learn something. Better yet, attend the conference and learn from all of them. The conference is intended for law firm leaders, managing partners, executive directors, chief marketing officers, directors of professional development, law school deans and anyone else interested in the future of the business of law. This year's Legal Futures Conference will take place in Chicago on October 28th and 29th, and is presented by the College of Law Practice Management in conjunction with the IIT Chicago-Kent College of Law. For more details about the conference, click here. To register, click here.